The year 267 is a significant one in the history of Athens. It was when the Herulians, a Germanic tribe from the north coast of the Black Sea, invaded the city and razed it to the ground almost in its entirety. As a result, the city, as it had been formed during the Roman period with the expansion of the residential area and the splendid public buildings, changed completely. A small area, around the Roman Agora, became the main residential area which, in 280, was enclosed by a wall known as the Late Roman Wall. This area would be the main part of the city for several centuries. However, efforts were made towards the restoration of at least some of the public buildings under the protection of Emperor Diocletian who assigned the reconstruction to a special official, the “corrector” of the province of Achaia (Corrector Provinciae Achaeae), since Athens came under the administrative jurisdiction of that province. The first building to regain its former appearance was Hadrian’s Library, probably because it was the place where the tax archives were kept. Even though it was confined, 4th century Athens was intellectually radiant. Its schools continued to operate and gathered students from all over the world, especially those who wanted to study philosophy and rhetoric. Important philosophers and orators such as Libanius and Himerius, Longinus and Porphyry, taught in the city’s schools. Some of the students of the 4th century were the future emperor Julian, Basil the Great and Gregory of Nazianzos. to the emperors Arcadius and Honorius. Many private philosophy schools were built near the Areios Pagos and on the south slope of the Acropolis. The repairs at Hadrian’s Library were made thanks to Herculius, eparch of Illyricum who had shown a great interest in the city. The 5th century was a thriving period for the Neo-Platonic Academy. It was headed by outstanding philosophers such as Plutarch, Syrianus and, the most renowned, Proclus (412-485), who was put in charge of the Academy in 427. The commentarial work by Proclus covers a very wide range of works by ancient philosophers. His most important works include the commentaries on the Platonic dialogue “Timaeus” and on the first book of the “Elements” by Euclid as well as an overview of the astronomical theories set out until that time. Recent excavations brought to light the location of his residence at the south slope of the Acropolis. Proclus had lived most of his life in Athens with the exception of a short period of time, in about 450, during which he left the city on the grounds of religious conflicts. He had been one of the most active citizens who participated in the common affairs of the city until his death in 485. The school acquired great prestige under his guidance and his works, despite the subsequent religious conflicts, have survived to a large extent. Throughout the 5th century, the city maintained a pagan way of life following the Greco-Roman tradition. Institutions of the Classical period such as the eponymous archon as well as rituals like the Panathinaic procession were still in use. Certain renowned families seem to have played a significant role in it. The archon patrician and senator Theagenes, one of the archons of that time, was sponsor of the Panathenaic procession. He was an eminent member of the imperial court who was married to Asclepigeneia, grand-daughter of the Neo-Platonic Plutarch. Another well known person of that time was Leontios, teacher of the Academy and father of Athenais. She is better known as Eudocia, a name she took when she was baptized a Christian. She became the wife of Emperor Theodosius II (408-450). She had received a classical education and was intellectually broad-minded. Nevertheless, she did nothing to prevent Theodosius from effecting persecutions, to a limited extent, against all pagans and from carrying off works off art from the city in order to enhance the beauty of Constantinople, the capital of the Byzantine Empire. 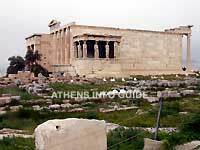 The palace she built near the Acropolis proves, however, that she maintained relations with her native city. Throughout the late antiquity, paganism and Christianity seem to have co-existed rather peacefully. As early as the time of Dionysus the Areopagite, there was a small Christian community in Athens that made its presence more felt from the 4th century onwards. Proof of its existence was found in clay lamps with Christian symbols and tomb slabs found during the excavations in the Agora. Perhaps the oldest Christian church in the city was founded in the 5th century at the centre of Hadrian’s Library. It was a central plan church known as Tetraconch, which later, in the 7th century, would be replaced by the basilica of the Great Virgin Mary (Megali Panagia). At the same time a large three-aisled basilica was built on the banks of the Ilissos river next to the martyrium that housed the relics of the martyr Leonides. It seems that the followers of Christianity multiplied dynamically after the measures taken by Theodosius in 437 when he banned all ancient cults. The Christian community received members of a particular economic and social prosperity. By the end of the 5th century they had almost prevailed over the pagans. This is clear judging from the appropriations of the sanctuary of Asclepius, following the death of Proclus, which, until then, was the main sanctuary of the Academy but also from the temporary exile of Marinos, the new head of the school. The final defeat of the pagans was brought about by the decree of Emperor Justinian in 529, which imposed the shutting down of the Neo-Platonic school. The last teachers (Damascius, Simplicius, Priscianus, Eulamius, Hermeias, Diogenes and Isidorus of Gaza) abandoned the city and sought refuge in the court of the Persian king Chosroes. The predominance of the Christians is also reflected in the conversion of the ancient sanctuaries into Christian churches. In the mid-6th century, the Temple of Athena Parthenos in the Parthenon was converted into the church of the Virgin Mary of Athens (Panagia Athiniotissa). In the early 7th century, the Erechteion changed into a three-aisled basilica, the Temple of Hephaestus at the Agora was dedicated to Saint George and later the sanctuary of Artemis Agrotera on the banks of the Ilissos River became a church dedicated to the Virgin Mary. At the same time, a number of churches were built on or very close to ancient monuments such as the three-aisled basilica dedicated to Saint Anargyri which was built on the site of the sanctuary of Asclepius and the basilica at the Theatre of Dionysos. An interesting fact is that the ancient sanctuaries were dedicated to saints of the Christian religion with similar qualities. The sanctuary of Asclepius became the church of Saint Anargyri (Healing Saints) and the fountain was transformed into holy water. The temple of the ancient doctor Toxaris was converted into the church of Saint John, the healer of fever. This habit was continued throughout the following period. The caves of the Acropolis were also transformed into Christian churches. For example, the cave of Pan became the chapel of Saint Athanasios and the cave of Clepsydra became the chapel of the Holy Apostles. During the last two centuries of antiquity, Athens experienced prosperity judging by the numerous pottery workshops that have been discovered but also judging from the new fortification of the city by Emperor Justianian at the border of the former Themistoclean Wall, a fact that reveals the expansion of the settlement. In the late 6th century (582), however, Slavs and Avars attacked the city causing complete devastation. This invasion marks the transition to a new era for which very little information is available. This new period was the conclusion of a series of changes (administrative, economic and social) throughout the empire, which signified the end of the cities as they were known since antiquity, namely as autonomous centers.